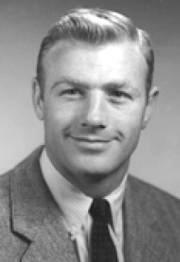 Pete Elliott coached at Nebraska for one season in 1956. At 29, he was the youngest coach in Nebraska history. He is also the first coach coach to take a team from the Big 10 and Pacific conferences to the Rose Bowl game. More information about Coach Elliott can be found here. This interview was done by David Max on May 22, 2007. 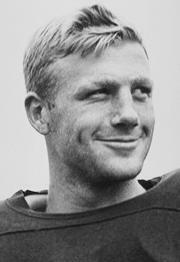 PE: Well, I'm not real sure but I would have to give a lot of credit to the fact that I was on Bud Wilkinson's staff. Obviously, whatever Bud Wilkinson did in those days everybody else wanted to do because they had great teams at Oklahoma. It made you very eligible to be a candidate for a head coaching job. PE: Bill Orwig was the athletic director that hired me. I thought the world of him. I thought he was a great guy. DM: What was the hiring process like? PE: Come to Lincoln and interview with the athletic director and some business people there. I also met with the president of the university. Then I went home and was offered the job. DM: What month were you hired? PE: I think it was December. DM: Do you have any recruiting stories? PE: No, I didn't have any time to do any recruiting. Oklahoma played in the Orange Bowl that year and I was on the staff, of course, and I went to the Orange Bowl. It was New Year's Day at that time. I felt that I should live up to my obligation to my coaching assignment in the bowl. I didn't have a lot of recruiting time. You meet guys in the fall and you assess them and they assess you and that kind of thing and then all spring. They didn't have letter of intents in those day and it lasted a lot longer, almost to the time when they went to school. DM: You were 29 years old and a college head coach at a major university. How did that feel? PE: Well, I don't know. You don't think about it until you talk about it. You have your own feelings. I coached long enough. I was five years at Oklahoma and two years at Oregon State for a total of seven years. I felt like I had confidence that I could do the job. DM: Do you remember what your salary was at Nebraska? PE: (Laughs) No, no I don't. It was 7500 dollars or something like that. I'm not really sure. I hate to guess but I know it wasn't ten. DM: Did you know Bill Glassford? PE: I met Bill. I met him at coaches' conventions and a few other things and, of course, Oklahoma always played against Nebraska each year. I got to know Bill a little bit. Not in a social way but just to respect him and to know him as a coach. DM: What do you remember about the road game at Ohio State? PE: We played South Dakota and then we played Ohio State. Having grown up in the Big 10 I knew Ohio State was a heck of a football team and they were just that. They were a tremendous team that year and we were just getting started. We did OK but they beat us quite soundly. DM: Why did you leave after one year? Was Cal a more attractive job? PE: Well, (hesitates) I guess so. Pappy Waldorf had been there and had some really good teams and played in a number of bowl games. They were really on top of the football map. Of course, I wouldn't say Nebraska wasn't. Nebraska had good teams in the past. I think they were fair when Bill was there and the year I was there. We were a fair football team. Cal was a top-notcher in every way and had a wonderful reputation. I will say I was very, very sorry I had to do that because I loved Nebraska. DM:What was your impression of Husker fans? PE: OUTSTANDING!!!!!! (Laughs) They were outstanding. When I first went there, after spring practice, I covered the state and made about 35 talks in something like 20 days all over the state. It was great. I enjoyed it and I enjoyed meeting the people. They were something else. Great enthusiasm. Nebraska is true Midwest. I'm a Midwesterner too, so I'm kind of proud of that. They represent everything good about the midwest .... AND football. PE: Oklahoma. I thought it was Oklahoma. Oklahoma had the teams at that time where they kinda .... they had 47 games in a row where they didn't lose. They had a heck of a reputation and had been to a couple of bowl games the years before that so I would say that Oklahoma was the number one rival. If not Oklahoma I would guess Colorado. DM: Who were some of your key players on the 1956 team? PE: I'm trying to think of some of those guys. There were some good players. He was already out of school by then, Bobby Reynolds. I got to know him extremely well. Bobby was a great halfback his sophomore year at the same time Billy Vessels was at Oklahoma and Charlie Hoag was at Kansas. Great running backs. All sophomores. We had good players. I kind of hate to mention one or the other. It's hard to do when I didn't have them more than one year. DM: Was he a good player? PE: Yes he was. He was a good player. I don't know if he was outstanding but he was a good player. PE: YES! I do. Those guys were already there. Bill and his staff recruited them. When you do your own recruiting thats when you really get to know them. DM: Do you recall any particular regular season games? DM: Did a lot of Nebraska fans make the trip? PE: I'm sure they did. They always do. That's almost a given, I think. DM: Who were some of your assistants besides Bill Jennings? PE: Dee Andros who played at Oklahoma and was the line coach at Nebraska and went with me to Cal and later became the head coach at Oregon State. Buck McPhail was fullback and backfield coach. Gene Stauber was a real great guy and a great character. Loved him very much. He coached pass defense and during the war he had been with a unit that wrote citations for war valor and so on. Every guy that intercepted a pass he would write a citation and give them a star. Put it on his helmet. Everybody on the team after a while wanted to read what he said. (Laughs) He wrote it up like a war story. "In the heat of battle during the fourth quarter with the score being so and so and the game on the line, the defensive back, whatever their name was, made an exceptional effort in driving through the man, leaped high to intercept the pass to save the day for Nebraska and so on and so forth. (Laughs again) He was a great coach that was fun to be around. I think a lot of teams put stars on there helmets for various things but that was the first time I had ever heard of it and Gene was the guy that did it. DM: Maybe Ohio State copied it? PE: Could be. They have their buckeyes and they put them on. We did at Cal. We put them on. The players loved it. They thought it was really good. He didn't do it for anything except for interceptions. He was fun. Billy Taylor was a grad assistant at that time. He went on with me to Cal and then to the University of Illinois. He became a very close friend. One of the best I've ever had. He's now in charge of the East-West game. DM: You were an assistant to Bud Wilkinson in his last coaching job, with the St. Louis Cardinals. How big an influence did Wilkinson have on your life and on your coaching philosophy? PE: Extremely important. Bud Wilkinson was a great coach and a great guy. He was a little different. He wasn't a Bear Bryant type of guy, chewing them out and so on. Although, he was as stern as he could be. He was close to his players and they had nothing but respect for him. He was a great influence on me. I learned one thing. Be yourself. I played under Fritz Chrysler, who was kind of a loose guy but a great, great coach. I kind of thought that was the way to be. Then I coached with Bud and I found out the only way to be is yourself. Honest emotions and honest everything else. Nothing contrived. Bud was a great inspiration to me. Also, I have to add, I think being on his staff gave me the jump to going to Nebraska and coaching wherever I was. I went to St. Louis because I was at Miami at the time as athletic director and we got together and after a while, ... we were very, very close friends and played a lot of golf together ... and he asked me to come. He was a good enough friend and I did. DM: What was Bill Jennings like? PE: Bill was a smart guy. Bill was an intelligent guy. He had been around the block a long time. Of course, he came from Oklahoma too. We were both on the same staff at Oklahoma along with Dee Andros. Anyway, Bill was a good coach. I think he had a good career. Not something that was a bell ringer, but he did pretty good. As I remember he brought in some of those guys where they had some good teams later on. He recruited some of those players. Anyway, I liked Bill and thought he was a very good coach. He was a guy who could do the job. DM: You were the "quarterback" in Michigan's single-wing offense. How did that position differ from the modern-day quarterback position? PE: Well, it was a little different. We started from the T and shifted to the single wing. So we did run some T. As the quarterback you were not the number one passer and that kind of thing. The tailback was what the quarterback is now. He runs and throws. The quarterbacks don't run that much. They did with the option but they don't run that much now. Some do ... you know that's a bad statement I just made. You look at Texas a year ago, Smith from Ohio State this year. Those guys are really good runners as quarterback. It was a different thing. The single wing was a wonderful formation. We were an unbalanced line. The single wing had a lot of deception. We had spinner plays. I thought it was a great offense. The problem came when you can't go to a single wing now or even hardly then because young players wanted to go into pro ball. There's no place for a single wing quarterback in pro ball. If you were a great player you went somewhere else. I did play tailback my first year in college and then I moved to quarterback. The quarterback threw some and ran some. Blocked some too, I hope. It was a little different in those days that they don't do now. We did call the plays. The quarterback called the plays. DM: Did you play any pro ball after Michigan? PE: No, I didn't. I was going to go to law school as a general graduate school education and then I had the opportunity to go to Oregon State. In those days they did not pay the big salaries. DM: What was it like growing up as the brother of another great athlete and then coaching against him? PE: Bump and I always did everything together. We were close. One year apart in school. We played football, baseball, and basketball together. I had a lot of admiration for him and I think he respected me and we played and wanted beat each other as bad as anybody could want to beat anybody but had great respect for each other so we put it on that basis. DM: Do you still follow the Nebraska team? PE: Yes, I do. I have ever since I left. They've had great, great teams and have done a wonderful job. DM: Have you been to Nebraska games since leaving as coach? PE: No. Well yes. I coached a team at Miami in Lincoln. It must have been '73 or '74. DM: Nebraska and Miami played in Lincoln in 1975. PE: That must be it then. DM: It must of been somewhat of a homecoming for you. PE: Yes it was. I have a lot of friends in Lincoln. DM: What was your impression of Memorial Stadium 20 years later? PE: I'll tell you. The stadium at Nebraska is always impressive. It's built like a stadium should be. It was always impressive. I enjoyed playing in it and I always enjoyed seeing it. It is like Ohio State. Big sides and so on. Michigan stadium is built kind of down to the ground. They don't have that much on top. The big stadium is kind of what you think of as a big school. PE: They had a little letdown for a while two or three years ago but they've come back the last couple of years and played excellent football. Really good. They beat Michigan in the bowl game, didn't they? This year they played a really good game. I think they're doing really good. They'll be right back where they always were. Nebraska is one of the big state schools that does not have a rival in the same category. So many schools have a university and then a state university. Nebraska didn't have that so all the people are interested in Nebraska. It was something. Really, really something. The fans were great. DM: Do you still golf? Have you ever shot your age? PE: Yes, I do. No, never shot my age. I either got too old too quick or my golf game went south. (Laughs) I've been close though. DM: Coach, thank you for sharing your Husker memories with us.